Jugendgästehaus Lichterfelde, Berlin, Niemcy : Rezerwuj teraz! 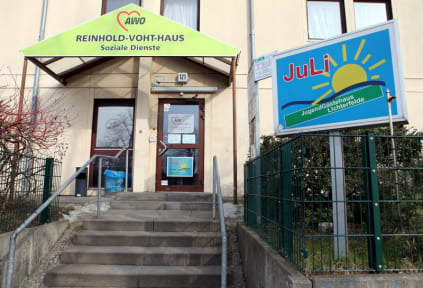 The Jugendgästehaus Lichterfelde welcomes you at our house! We are a hostel specially for the ones, who are looking for a comfortable and inexpensive accommodation in the capital of Germany. Our location is in the south of Berlin. Immediately in front of the hostel is a bus stop and only a few meters away from us, drives the S-Bahn. Within 20 - 25 minutes you can easily get to the center of Berlin, and visit places and attractions, such as the Brandenburger Tor or the Mauerstreifen. Since we have a bed sheet obligation, you can rent them for a fee of 3.00€ from us or of course bring your own bed sheets. In order to make our guests' stay as comfortable as possible, we have in our lounge a few magazines, community games, various books and a TV. Of course we have free Wifi in our entire house. Beside our breakfast buffet from 8.00 – 9.30 am, we have a little tea kitchen with a hot drink vending machine, a microwave, a fridge as well as cutlery.